Welcome to the website of chiropractor Dr. Harry Lefkowitz, DC. Our offce, Lefkowitz Wellness Center, is located at 153 Ft. Lee Road in Teaneck, NJ 07666. Dr. Lefkowitz accepts patients from the North Jersey area, particularly Bergen County, as well as New York and surrounding states. If you are looking for a New Jersey chiropractor, or are curious as to whether chiropractic can help you with neck pain, back pain, sciatica, headaches, pinched nerves, auto accident injuries or other assorted problems, call us to set up a free initial visit! And yes, we accept most medical insurance. We currently are offering new patients a free exam and consultation .A $125.00 value Call the office today at 201-530-1000 to make an appointment! Dr. Lefkowitz has been treating infants, children, adults and seniors in Teaneck, NJ for over thirty years. He specializes in difficult chiropractic cases, with many patients traveling from other states to seek his expertise. Some of the conditions he treats include: Back pain, neck pain, headaches, sciatica, whiplash, posture problems, carpal tunnel, shoulder pain, wrist pain, joint stiffness, muscle spasms, dizziness, sports injuries, herniated discs, pinched nerves, auto accident injuries and children’s sports injuries. Dr. Harry Lefkowitz, a Licensed Chiropractor, Certified Applied Kinesiologist and Certified Nutritionist, applies his skills to resolve difficult cases when others have been unable to do so. 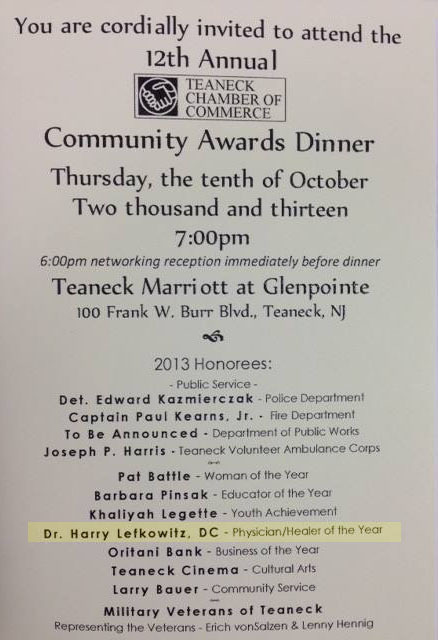 Dr. Lefkowitz honored 2013 Physician/Healer of the Year by Teaneck Chamber of Commerce!